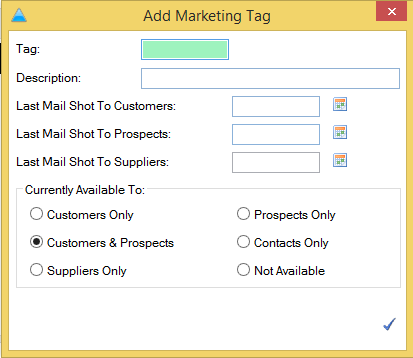 The following help sheet explains how to add new marketing tags to Enterprise and how to edit existing tags. 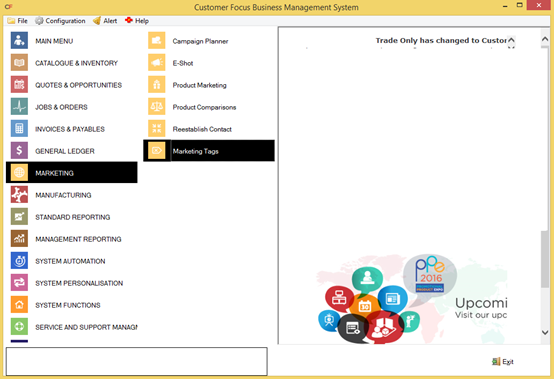 The ‘Marketing Tags’ screen will then be displayed. Click the blue ‘+’ button to add a new marketing tag or highlight an existing one and click the blue triangle to change it. 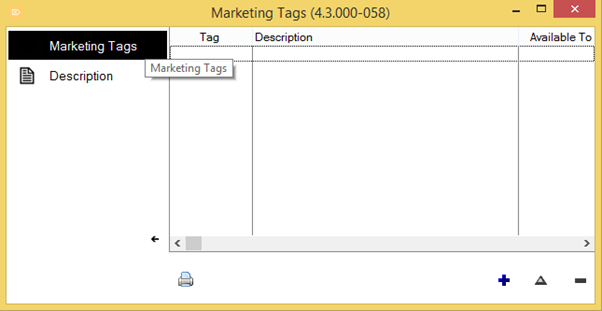 The ‘Add Marketing Tags’ screen will then be displayed. Last Mail Shot To Customers – Allows you to set a cut-off date for this tag when linking it to mail shots for customers. Last Mail Shot To Prospects – Allows you to set a cut-off date for this tag when linking it to mail shots for prospects. Last Mail Shot To Suppliers – Allows you to set a cut-off date for this tag when linking it to mail shots for suppliers. Currently Available To – Allows you to specify which banks of contacts this tag is available to i.e. only suppliers, only customers, customers & prospects etc.